Call us at (270) 646-5219 to purchase. 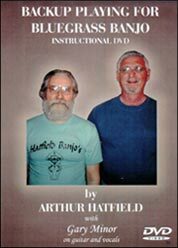 Learn Scruggs style banjo quickly from this 2 hour dvd. It takes you all the way from putting on the fingerpicks to playing several songs. It shows you all kinds of picking techniques and chords all the way up the neck from the first fret to the last, which is a must to know to work with a band. This is something that hardly any videos show and it shows you how to play some instrumentals and/or songs only. This is one of the most simple, easy to understand video's on the market today. Learn Scruggs style backup. This is a rare video, because there is not much material on the market for backup which is becoming a fading art. Here is 2 hours of backup shown and clearly explained by Arthur behind the guitar and vocals of Gary Minor. This is one of the most simple, easy to understand backup videos on the market today. 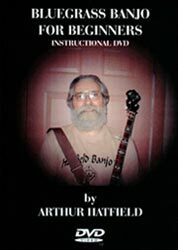 This 2 hour dvd by Kentucky banjo builder and picker Arthur Hatfield, shows all kinds of tips to improve your banjo. It shows how the bridge, tailpiece, head tension and how different woods such as mahogany and maple all play a big part in changing the tone of your banjo. It shows all kinds of adjustments such as straightening the neck with the truss rod, and adjusting the string height with the coordinator rods. It shows how to improve the sound and increase the volume by adjusting your resonator. It also shows a banjo taken apart and put back together piece by piece, and very clearly explains each step. It shows how to tune the head. 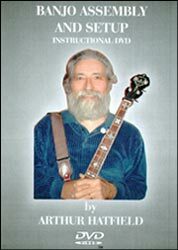 This video is a must for the beginner and set up man and also for the picker who is always expermenting on trying to improve the sound of your banjo. *All other countries pay actual shipping.